By scoring 12 points on Wednesday night at Cal Lutheran, Michael Edwards etched his name in the record books and became Caltech's all-time point producer, moving ahead of George Papa '94. Edwards stands atop the history books with 1299 points and still has 19 games left in his career. He tied Papa's record on a 3-pointer with 11:46 remaining in the second half and set the record at the 1:19 mark as he converted a hard drive to the right. Papa's record, which he accomplished in just three seasons of play, stood for nearly 18 years. He still owns the marks for most points scored in a game with 43, most field goals (177) in a season and a career (506), and points in a season (476). He shot 51 percent from the field his senior year. 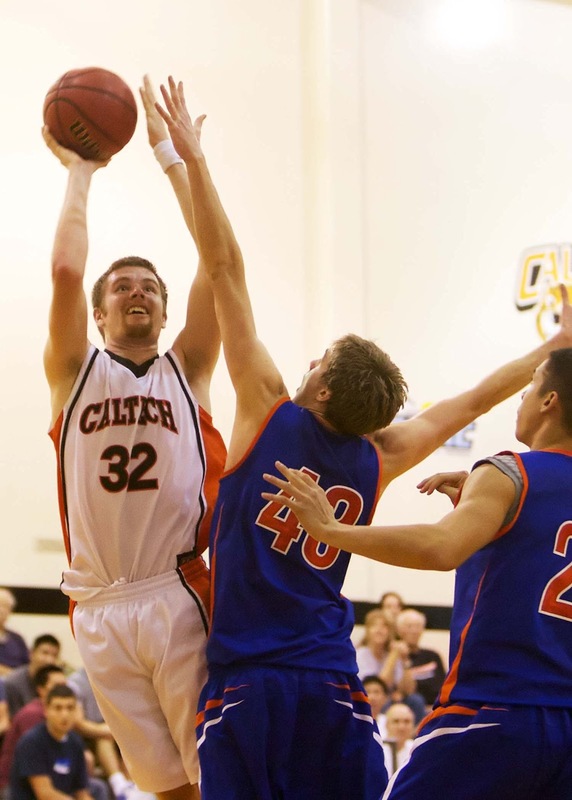 Papa, who averaged 10 rebounds a game for his career, is also in Caltech's 500 Rebound Club. Edwards, nicknamed Money for his ability to score points in bunches, is also demonstrating how his game has evolved by producing career-highs in rebounds and assists. He has four 30-point games and owns the record for most points scored in an NCAA game (35), most 3-pointers made in an NCAA game (7), most field goals made in a game (13), and most 3-pointers made in a season (62). Edwards, from nearby Canyon Country, was named to the SCIAC all-conference team last season and is a computer science major.